In 2011, Durham-Chapel Hill-Carrboro Metropolitan Planning Organization completed a study and recommended improvements for the N.C. 54 Corridor. 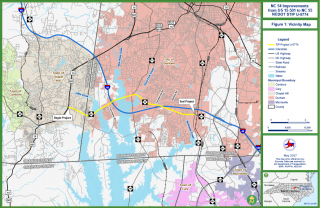 Then, the NCDOT completed a project feasibility study which resulted in the recommended improvements being added to the 2040 Metropolitan Transportation Plan and the 2016-2025 Metropolitan Transportation Improvement Program. The proposed improvements will affect U.S. 15/501 in Chapel Hill to N.C. 55 in Durham. If you own property along this route, you may want to consider contacting an eminent domain attorney. The project is still in the planning phase and design options are being considered, so it is best to be prepared in the event that these plans include parts of your property. N.C. 54 is considered to be an important road due its prominent role in serving residential, commercial, and institutional communities in Chapel Hill and Durham. It also serves as a connector to residents commuting to Raleigh and RTP. The proposed improvements will make way for reduced traffic congestion and will provide accommodations for pedestrians, cyclists and public transit options. The crash rate is also higher than average along this corridor, so it is hoped that the changes will improve safety conditions. Some public meetings for this project have already taken place, but another meeting is scheduled for Fall 2018 to formally select a plan for moving forward with the project. Contact an eminent domain attorney – Securing an eminent domain attorney early on in the process will give you piece of mind. We can guide you through the process and ensure that you are fairly compensated for your property. Be a part of the process – Information is power. Obtain all documents regarding the project from the NCDOT and attend meetings regarding the project. The NCDOT is required to inform the public of its plans. Do not agree to the first offer – The government will send an appraiser and make an offer based on his or her appraisal. This will be the lowest possible offer, so do not accept it. Hire an independent appraiser – Hire your own appraiser, so you have a second opinion on what your property is worth. This will help you and your attorney negotiate with state so you get the best possible offer. If you and the government agree on compensation, the sale can proceed as normal. However, if this does not happen, eminent domain proceedings may begin. It is paramount to have experienced eminent domain lawyer representing you throughout eminent domain proceedings. Eminent domain is powerful tool wielded by the government. It’s an unfortunate reality, but once eminent domain proceedings begin, it is almost certain that they will obtain your property on way or another. An experienced attorney can ensure that you get a fair price for your property. The government begins eminent domain proceedings by filing a complaint and declaration of taking in the superior court of the county in which the property is located. The property owner or government entity requests the appointment of commissioners within 60 days after the property owner files their answer to the complaint. Commissioners should be disinterested property owners residing in the county. The commissioners will visit the property, hear testimony, and hold hearings to determine value and compensation. If the property owner is still not satisfied with the ruling of the commissioners, he or she can appeal within 30 days and the case will be heard by a jury. Eminent domain refers to the power of the government to obtain property for public or private use. When you are dealing with eminent domain proceedings, you will hear many other legal terms in reference to this process. Land Condemnation – This refers to the process in which the government acquires land through the power of eminent domain. Right of Way Agent – The Right of Way Agent is in charge of acquiring properties for large projects, such as road construction. If your land is in the way of a project, you will be approached by a Right of Way Agent for initial discussions. Partial Taking – If only part of your property is needed for a project, it is considered to be a partial taking. Inverse Condemnation – This term refers to the situation in which your land isn’t acquired by the government, but it is rendered unusable or loses value due to a government project or a change to a statute or ordinance. This may also be referred to as a Regulatory Taking. Just or Fair Compensation – This refers to the amount of money paid to the property owner. This could include the property value, lost value, and relocation expenses. Uneconomic Remainder – If a parcel of land is left that is considered unusable to the government and the owner, it is considered to be an uneconomic remainder. If your property lies in or near the land needed for the N.C. 54 Corridor Improvements between U.S. 15/501 in Chapel Hill to N.C. 55 in Durham, the NCDOT may acquire it using eminent domain. Currently, the project is in the design phase and public meetings are still being held. Be a part of the process now and you can save yourself headaches later on. Right of Way acquisitions are expected to begin in 2023. Could your land be affected? 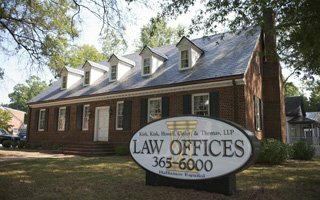 Contact an experienced eminent domain lawyer at Kirk, Kirk, Howell, Cutler & Thomas, LLP for advice on how to proceed. If you are or already have been contacted by a Right of Way agent regarding this project, call our Raleigh law firm immediately at (919) 615-2473 or complete the form below. We will guide you through the process and ensure that you are fairly compensated for your property, and any other associated costs that come with eminent domain cases.